I have wanted to go on a Hood Huggers Tour for a few months, and I'm glad I finally made it a priority this February for Black History Month. After digging into Asheville history for the past few years (see my history blog https://ashevillehistoricinns.wordpress.com and my book Historic Inns of Asheville) my research has shown me there is an enormous gap when it comes to the recorded history of black Asheville - so I was happy and excited that DeWayne Barton has started to fill that gap with the Hood Hugger Tours - which are so much more than just history tours. 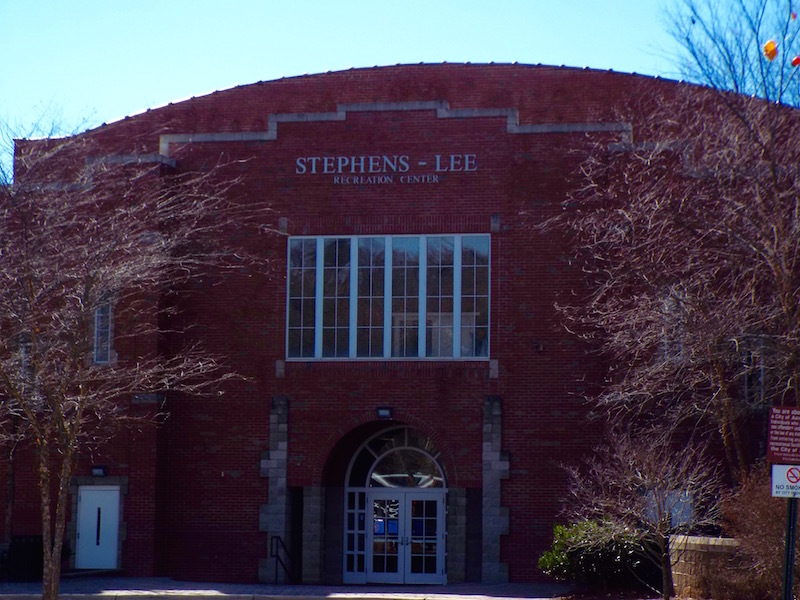 Our Hood Huggers driving tour started in front of the Stephens Lee Recreation Center - once the gym of Stephens Lee High School. Opened in 1923 Stephens Lee was the only secondary school for African-Americans in Western North Carolina, which meant students rode the bus for hours in order to attend, from not only Buncombe county, but Yancey, Henderson, Madison and Transylvania. The moniker ‘Castle on the Hill’ was appropriate since the beautiful goliath that was Stephens Lee overlooked downtown Asheville from Beaucatcher Mountain. The last class graduated in 1965, after the passing of the Civil Rights Act ended segregation (10 years after Brown vs. Board of Education was supposed to), and students were eventually combined at Asheville High (previously Lee Edwards High) in 1969 (the integration of schools in Asheville, as many other places, was not easy, I will have a blog about that soon on my history page). The main building of Stephens Lee, the ‘Castle on the Hill’ was torn down overnight with basically no warning in 1975 - with alumni scrambling to save pieces of the historic school. 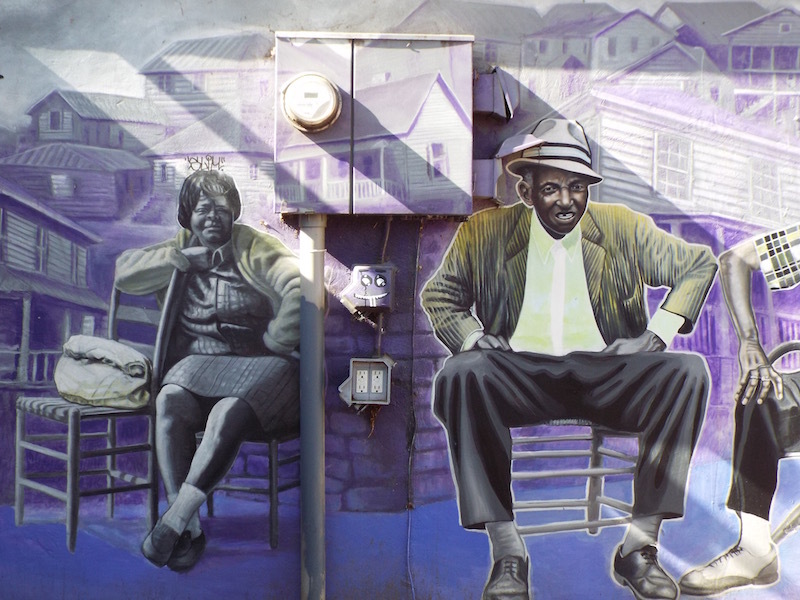 We walked the halls and visited the autograph wall of Stephens Lee Recreation Center before walking down to the oldest community Food Forest on the East Coast - the Dr. George Washington Carver Edible Park. Named after the African-American botanist and inventor, the park was planted over fourteen years ago and hosts over 40 varieties of mature, fully-fruit bearing fruit and nut trees including figs, apples, pears, chestnuts, hazelnuts, plums, peaches, grapes, and paws paws. After enjoying the view from the top of the hill we boarded the bus to continue the tour, which was centered around churches, schools, and community centers that have anchored the black communities of Asheville. Led by DeWayne Barton, artist, poet, visionary and founder of Hood Hugger LLC, it looks at the past, present and future of African-Americans in Asheville with the goal of driving social change, preserving, protecting, and providing economic opportunity for neighborhoods left behind despite of, and perhaps because of, Asheville’s economic booms. Our tour ended at the Arthur Eddington Education and Career Center - previously the Livingston School, which was a turned into a Parks and Recreation center after segregation ended. After a three year renovation it opened as the Arthur Eddington Education and Career Center. It is the home of multiple organizations, including Green Opportunities, whose mission is to train, support, and connect people from marginalized communities to sustainable employment pathways. There are numerous concerns that the tour brings to light - disparities in income, education, business and housing that plague Asheville; and in a town where the economy is booming more could be done to assure all children have opportunity for a good education and amply opportunity as they grow. In this ‘Foodtopia’ where there are thousands of restaurants shouldn’t everyone have enough to eat? The billions of dollars spent on the new I-26 connector could take out the housing projects of Hillcrest and the historically black Burton Street neighborhood in West Asheville just as the urban renewal of the 1960s and 1970s eradicated the black neighborhoods and businesses around Eagle Street. Concerned citizens showed up and spoke up tirelessly against the enormous project having an impact on these neighborhoods, and it seems to have made an impact. What I appreciate about the tour is Barton focuses on the victory, not the victimization, of blacks in Asheville. How black businesses thrived in spite of segregation and laws that benefitted white citizens and businesses but purposefully omitted blacks - such as banks ‘redlining’ the black businesses and neighborhoods - refusing loans and federal aid based on race, a practice that was legal in the United States until the 1968 Fair Housing Act was passed, yet still practiced afterwards, leading to the 1977 Community Reinvestment Act, and several multiple multi-million dollar lawsuits in just the last few years settled against lending companies who were found to deny lenders based on race. Everyone should take this tour. Injustices can seem overwhelming, and what needs to be done to improve our communities, especially for the children, can seem insurmoutable, but to answer - What can I do? The first step is to just get educated. Listen to someone’s story that greatly differs from yours, take a tour around your town into neighborhoods different from your own. You can’t do everything, but you can do one thing. And maybe when you do that one thing, you can see something else you can do - pointing out the truth when someone else is spouting inaccurances, standing up for someone who didn’t have the priviledges you had, and acknowledging those privileges. Giving money to a cause. Consciously seeking out diversity. Hood Huggers opens up the conversation fearlessly, which is what this world, and Asheville needs.